In a review I wrote within weeks of Hamamori's opening, I said that eventhough the food was exquisite, you'd need to spend a month's salary to get full. Great sushi has never been cheap, but no one else in OC has been able to get away with charging as much as James Hamamori does. Dinner for two at his eponymous South Coast Plaza eatery will climb into the triple digits faster than you can say "omakase" ($80 per person for food, an additional $40 for wine or sake pairing). This is the reason why you should get someone else to pay for it. For example, a repentant boyfriend trying to make amends, or that sales exec who's desperate to get a signature on a dotted line. Let them buy your way into your good graces with a meal prepared by Hamamori himself; a sushi feast to break bank accounts and breach credit limits . . . just not your own. In that same month, Hamamori seemed to take proactive steps in shedding its reputation. After all, this was around the time that the stock market took a dive and it became clear our economy was in the crapper. It was bad to be seen as one of the most expensive restaurants in the county. What Hamamori did was to revise its omakase menu with tiered pricing. Don't get me wrong: on the whole, Hamamori still ain't cheap. You can still get into trouble with creditors if you opted for the top-end meal. But now, at least, there was a $48 5-course option that effectively slashed the original cost of omakase in half. A few weeks ago, to celebrate a birthday, I returned to try it. And if you asked me now, I would have to say: compared to other restaurants of the same caliber, Hamamori is not overpriced. 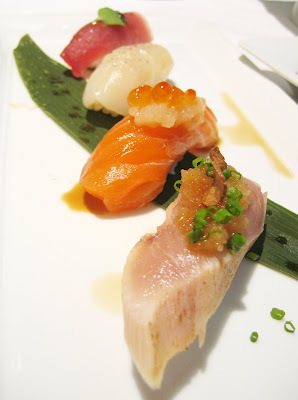 Heck, I'd even go further and proclaim that I prefer its omakase meal over Bluefin's $35 5-Course lunch. The reason? Bluefin's omakase is a crapshoot. You don't know what's going to happen after you've placed your bet. And lately for me, every subsequent Bluefin omakase meal has been a lesson on the law of diminishing returns -- each were never as good as the one that preceded it. Hamamori's omakase, on the other hand, is as dependable as a treasury note. Their set menu doesn't change (or at least not yet). So although the element of surprise goes out the window, there's an unshakable consistency and sure-footedness in the execution of the set game plan. And in these risk-averse times, it's always reassuring to know that you're going to get what you paid for. Japanese mushroom salad started the meal -- a first course that was as brisk a wake-up call to the palate as any I've had, containing field greens dressed in a sour dressing and more mushrooms than a Smurf village. The second course consisted of three appetizers. There was a rissole of kobe beef and foie gras, a billiard ball-sized orb made of deep-fried ground beef that sang of Scotch egg, but without the egg. Next, rock shrimp tempura draped in a mayonnaise-y sauce, acting very much like the famous Chinese banquet dish, Honey Glazed Walnut Shrimp, but again, without the walnuts. Beneath it, there was a lacy, fried shiso leaf that crunched as loudly as a kettle potato chip. Last but not least, one of Hamamori's signatures: the okaki-crusted asparagus, where those tooth-jarringly hard Japanese rice crackers are put to good use as a crunchy breading. Third course was sushi. All were fresh, plump, hand-formed ovals as sleek as bullets. Each piece was pre-seasoned with such things as ponzu and sea salt. No extra dipping or wasabi was required. 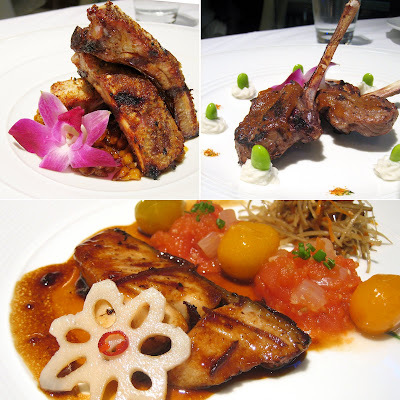 For the main course, you are to choose one from three available options. Pork ribs were meaty bones crisped to burnt edges, with a deeply marinated and pronounced miso-flavor that seeped through each swarthy strip you tore off. Below was a starch that reminded me of baked beans, but wasn't. Miso, lots of it, was also responsible for the bold flavor of the petite lamb chops. The savory paste was slathered on them like spackle. Black cod, the only fish option, had the most going on. Tomato salsa, pickled kumquats, marinated gobo, and a trimmed slice of lotus root flanked a thin, well-roasted slab that was so aggressively seasoned it was almost too salty. Eaten with plenty of rice, it was perfect. 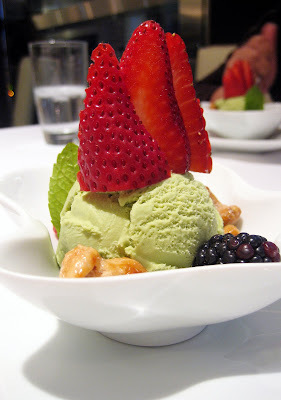 To close the meal, homemade organic green tea ice cream arrived with a gravity-defying strawberry fanned out like a sail. Crunchy, addictive honey glazed nuts and more fresh berries were strewn as garnish and an added treat. So, there you are: a reasonably priced prix fixe at Hamamori. Something you could probably swing for that special occasion dinner, even if you're not expecting an AIG bonus check in the mail. OK. Bad joke. Awesome review. I'm nodding in agreement and shaking my head sadly at the line about diminishing returns at Bluefin. We ate there a few weeks ago, and my wife is still hinting that I should knock it a notch or two. Still, Hamamori for $48 sounds great. I'll have to give that a try. Thanks for the tip. Looked like you won at this crap table. I didn't know they were the most expensive meal in OC. I guess the new honor goes to Wasabi at Tustin? Wish me luck. I'm getting ready to go to a place that can top the Cut (I think you would enjoy it). I'll be on noodle cup diet very soon. BTW, AIG check will only get you a happy meal. Ha! more mushrooms than a Smurf village. Oh how I do look forward to your ever amusing analogies. That dessert presentation really is lovely. I remember this place from you before. Still need to try. Want to do Sushi Wasabi for my birthday though, whether it breaks the bank or not. "And in these risk-averse times, it's always reassuring to know that you're going to get what you paid for." So true! I'd rather spend a pretty penny on one really great meal than whittle away my dollars on several mediocre ones that I could prepare better at home. Everything looks incredible... I would definitely make a bet on a dinner at Hamamori. Thanks for the review, I've been wanting to try this place.. Maybe now I will. Your pictures as usual are excellent Elmomonster - and that green tea ice cream with fresh strawberries dessert sounds delicious !!! Hmmm $48 Omakase sounds cheap but it looks like alot of fillers and just a few slices of good fish. 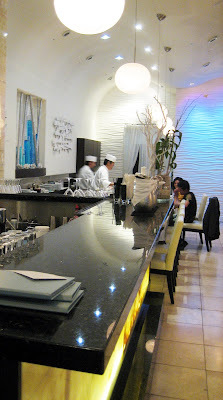 Elmo, please check out New Harima Japanese Cuisine in Cypress. Heck, I'll even treat ya.. I would love to get your feedback on that place. Chef Dai-san is pretty crafty. Nothing saddens me more to say that about Bluefin. But after three trips, I could come to no other conclusion. I never saw or tasted anything there that equaled or topped the first omakase meal I wrote about...which is unfortunate, because I would've loved to continue paying $80-$100 for it! You, sir, are living my foodie dream. Like I said in a comment on your blog, meals like what you had at Cut make me envious that I don't live in L.A....and have an AIG bonus check coming. If someone's treating, I'd ask them to take me to Sushi Wasabi. You do get their money's worth in sushi there. Be sure the person treating can plunk down at least $75 per person if you're not that hungry. $100 if you are! Hamamori's best for the sushi lover who's into the nouvelle -- Iron Chef Morimoto style food, the kind of stuff that might make ol' Katsu Aoyagi scoff...but good stuff all the same! Yes! Bet on Hamamori before you bet on Bluefin. I wish I didn't have to say it, but it's true! By the way, I hope it's clear to everyone that for the main course, you get your choice of one (1) of those three proteins. You don't get all three! It's worth it for the special occasion. But again, I have to reiterate so that there's no misunderstanding: you get your choice of only one (1) of those three proteins for the main course. And it was!!! The honey crusted nuts most especially. True. The meal is only 20% sushi course. Not the place if you really want to binge on raw fish (that's Sushi Shibucho for me). It's nice if you want the fine-dining-Japanese. But you got my attention with New Harima. And not because you said you'd treat!!! I always rely on recommendations on sushi joints. I never go into one cold off the street. So what's not to miss there? That is plenty of food, but I agree- there is pretty little sushi or raw food! I like how they plated everything, especially the dessert and the sushi. Actually, all of them are pretty much good enough to be placed in a national magazine :). The black cod looks delicious but I don't know how tomato salsa works with it! The salsa was quite mild, so it didn't clash. Normally, I'd like my cod unaccompanied by extra thingies, but this dish really worked for me. The pickled kumquats I ate as a palate cleanser. THEY WERE INTENSE! Definitely the kind of place I would ask to go for a birthday or anniversary. That kind of meal is worth the price! We are there last night with a good friend for his birthday. The $90 omakase is also marked down to $69, where, actually, it's a pretty good value too! You get an additional sashimi appetizer, two of the main course dishes (the fish plus a choice between lamb and kurobuta), and trade the mushroom salad for a small dungeness crab salad (which serves as a good appetizer). It IS that kind of place. But then, I wouldn't mind being treated to Mitsuwa for Santoka Ramen on my birthday either! Holy smokes! You're right! THEY CHANGED THE OMAKASE THE DAY AFTER THIS POST! My meal would've been $3 cheaper! I need to put up an update! 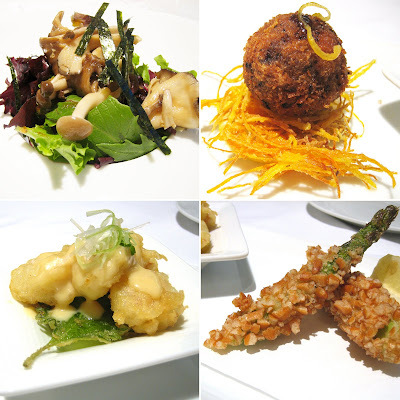 Thanks so much for highlighting Hamamori and the Chef's Tasting Menu. We went last night for our anniversary and it was simply fantastic. The smaller menu is plenty filling and if one likes sake, they offer a sake pairing with the tasting menu (except for dessert) for an additional fee. The pairings were spot on, and all the were sakes very good to excellent. If one is on a smaller budget, they offer a couple of sushi / sashimi offerings each day for half price until that offering is sold out. Sadly, the place was only about 40% to 50% full on a Saturday night.